The original U73b Compressor hardware was commonly used for mastering between 1960 and 1980. It is an all-tube vary-mu compressor/limiter with adjustable release time option. We kept the circuit exactly as it was originally designed and only added input and output gain (before and right after compressor circuit) to help with proper adjustment of the compression. The plugin effect has been also supplemented with a VU meter and selectable side-chaining. U73b is great for mastering, mixing drums, bass, guitar, vocals and voiceovers. Plugins built in newer IDEs with more effective code. Default calibration parameter value mechanism added, calibration parameter range changed. "The most musical compressor I've ever heard." "I use U73b Compressor on most of my mixes. Magic." 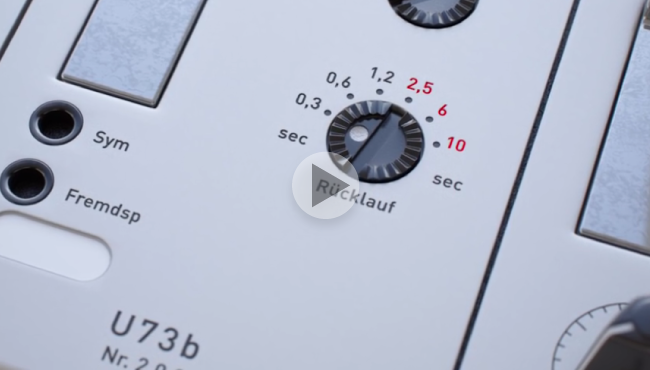 Compressor/Limiter Switch – is the upper U73b knob and it switches between Compressor mode (Kompr), Bypass (Durchschalt) and Limiter mode (Begr). The compressor mode has lower threshold setting and very gentle increasing ratio, in opposite, the limiter mode provides higher threshold setting with higher ratio but still with smooth knee. Release Time – the first three positions offer fixed release time, the other three positions (marked red) provide adjustable program content dependent release time option. Out – adjust output gain after the compressor/limiter circuit. 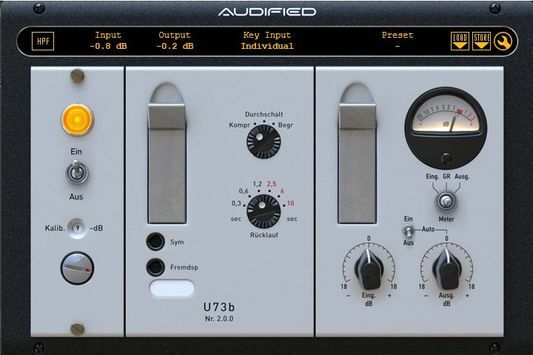 HPF – U73b is a vintage device and as such it may not meet present mastering demands. We added a bass management button that simply switches between original sound and desired modern sound (without low frequencies bypass).